This intersection should be high on the city's priority list to redefine as a pedestrian node, and as the entrance to a revitalized pedestrian district at the center of a historic neighborhood. 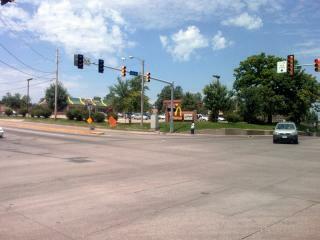 It would be difficult to incorporate auto-oriented uses such as a drive-thru and gas station into such an intersection. I recently had a conversation about this intersection with a neighborhood resident who had a different take on it. He said that the McDonald's was good to have at this intersection for the following reasons: (1) it was extraordinarily successful, as the busiest McDonald's in the Des Moines area, and (2) it demonstrates that a business can be successful in the neighborhood. 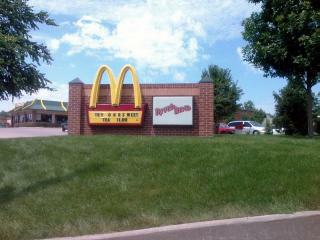 McDonald's built this sign and neighborhood entry monumentPerhaps he is right. It doesn't make a whole lot of sense to exclude a use, particularly one that has been successful, relatively involved in the neighborhood, and generally appears to do a good job of maintaining the site. What does make sense is for the the city to plan for a more graceful entrance to the neighborhood. Eventually, every McDonald's franchise must perform a major rehabilitation or rebuild. When this happens, it is critically important that there be a plan in place to guide the rebuilt structure towards a more urban form and the traffic towards a more pedestrian friendly pattern. This is an example where a form-based zoning overlay would be an excellent solution. A form-based overlay district would allow the 6th Avenue Corridor to be "re-planned" as a pedestrian corridor without dictating the uses. A McDonald's could peacefully co-exist with other uses as long as the form was more urban.